The latest poll showed almost an equal unawareness by the Japanese people on how to further cope with Pyongyang's nuclear threat, despite Tokyo's alleged preparation of an emergency evacuation plan for its citizens from the Korean Peninsula. MOSCOW (Sputnik) — Japanese citizens are almost equally divided on the country's policy toward North Korea's nuclear provocations, specifically about whether Tokyo should ramp up the pressure on Pyongyang or work to launch a dialogue, a latest poll revealed on Tuesday. The Asahi Shimbun newspaper survey showed that 40 percent of respondents believe Prime Minister Shinzo Abe's government should exert more pressure on North Korea amid its nuclear activity, while 45 percent want to establish a dialogue with their northern neighbor. Abe's approval rating, according to the poll, has climbed by 3 points since August and now stands at 38 percent. The poll was conducted following North Korea's latest nuclear test conducted on September 3. On Monday, Abe announced that the government was planning to increase its defense capability by reviewing Japan's National Defense Program Guideline, which serves as a basis for the country's security strategy, in order to give an appropriate response to North Korea's latest missile and nuclear tests. Last week, Japan-based media reported that Tokyo was preparing plans for a possible evacuation of close to 60,000 citizens living or visiting South Korea in response to the rising tensions on the peninsula following North Korea’s most recent nuclear test. These tests, all conducted in violation of UN Security Council resolutions, has exacerbated the situation on the Korean Peninsula over recent months. 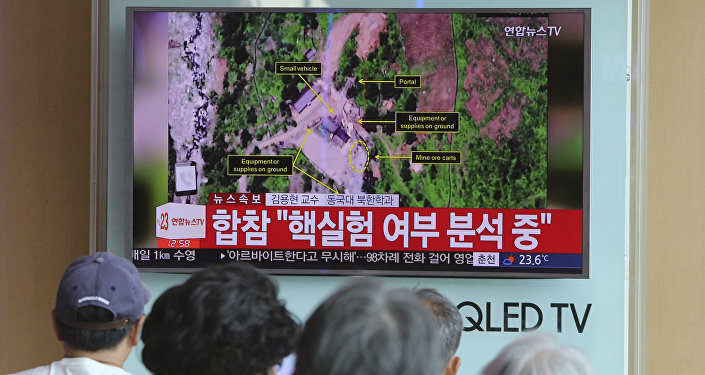 The latest was conducted on September 3, when Pyongyang announced that it had successfully tested a hydrogen bomb that could be loaded into an intercontinental ballistic missile. Several days before the test, Pyongyang launched a missile over Japan.